In the ten years since this book was first published, the USEF, American horse sport's governing body, has revised and added rules and regulations that affect novice hunter-seat riders. 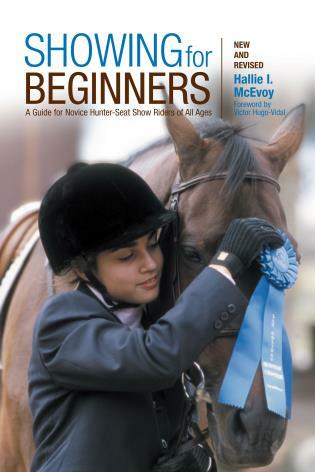 This user-friendly and encouraging guide reflects those changes and offers invaluable advice for riders, parents, and trainers: how to find an appropriate show and trainer; horse and rider preparation; entry requirements; show-ring etiquette; and what judges look for in a range of novice-level classes. Updated photos enhance the text and provide a more contemporary look. Hallie McEvoy has been a riding instructor and a licensed United States Equestrian Federation (formerly American Horse Shows Association) judge at a range of equestrian competitions throughout the country. Her articles and photographs have appeared in many magazines, including Horse Show and The Chronicle of the Horse. The author of Horse Show Judging for Beginners, she lives in Bolton Valley, Vermont.